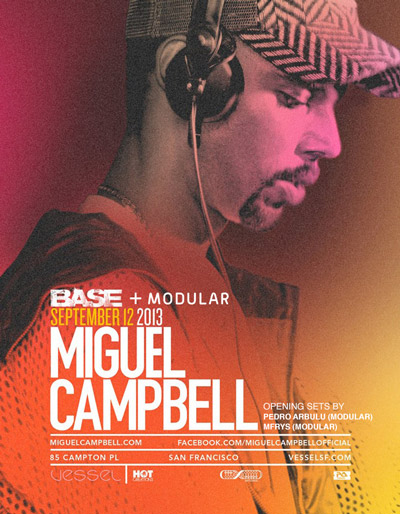 The fruits of many years hard work are finally coming to Miguel Campbell. Though he’s been making music for quite some time, it’s only more recently that he has started to receive the international recognition he deserves. The first to spot his true potential was the mighty Hot Creations who snapped up Miguel as a new addition to their family in 2010. Since then he has pushed out several releases on the label (including his recent first long player), with other releases on Hot Natured, Toronto’s No. 19, the always lovable Wolf & Lamb as well as his personal label, Outcross. Chief amongst those releases was one of 2011’s standout tracks in the form of ‘Something Special’, a devilishly simple and sensuous tune that captured the zeitgeist perfectly and was heard on dancefloors all over the planet. Dancefloors on which Miguel himself has often played himself, in fact: in recent times there have been Hot Natured parties in London, a tour of South America, a set at Berlin’s Watergate and a Crosstown Rebels Party at The Warehouse Project to name a few. All this is less surprising given the fact Miguel admits he comes initially from a DJing background. On the heels of one of his biggest years to date, Miguel makes his return on Thursday, September 12. Come catch this full time member of the Hot Creations crew bring his steamy blend of vocal infused and French inspired house to the finest sound system on the West Coast. $5 with RSVP before 11pm or $8 after // $10 without RSVP // $8 advance tickets valid all night.